How is this for an amazing beach view! 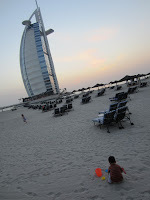 The Jumeirah Beach Hotel in Dubai was out of our budget for a place to stay, but it was well worth it to head over to their Beachcomber restaurant for the delicious buffet and for the view of the neighboring Burj Al Arab. When B was finished eating, we could watch him play in the sand from our beachside table. And when the sun set, we were treated to the amazing changing face of the Burj Al Arab.